The Pomeranian dog breed has something of a claim to fame in that it’s the only small dog breed with a Spitz heritage. The result of this heritage is that despite their small size, Pomeranians are very independent and strong-willed. Don’t let this put you off though as Pomeranians are friendly and loving dogs and make great pets. And of course, they’re incredibly cute and cuddly little dogs too! The Pomeranian is a lively and spirited little dog, very independent and adventurous; a real extrovert. They’re full of energy and will constantly rush around from one place to another. Luckily, because they’re so small they don’t need much room for all this madcap scurrying! So they’re perfectly suited for apartment living. That said, they do require attention to prevent them from getting bored and getting themselves into mischief. So they’ll need playing with every day and regular exercise in the form of walks and outings. It’s a good idea to vary the walks to prevent your Pom from getting bored and to allow them to explore new places. In terms of play, they love squeaky toys and playing fetch with a ball. They also love a good tug of war, but they’ll refuse to give in so you could be there for a while! Poms are docile and affectionate little dogs that love cuddling and sitting on your lap, but only once they’re tired and worn out from all their exercise. They’ll often latch onto one particular member of the family more than others. Pomeranians are also very bright and intelligent little dogs, but despite this they seem to forget how small they are. They will often be very bold and assertive towards much bigger dogs, and because of this you must take care when out and about with them. The alertness of Pomeranians make them very good watchdogs as they’re always on the lookout. This can lead to excessive barking though, so they need to be trained to be quiet at your command. Because of their small size, Poms aren’t really suited to families with small children as they’re just too fragile and easily hurt. They’re also not really suited to being left alone for long periods so aren’t be the best choice if you’re going to be out at work or otherwise away from home a lot. Unless you get two Poms to provide company for each other, of course! According to the American Kennel Club (AKC), the Pomeranian height should be between 8 and 11 inches at the shoulder. The Pom weighs between 3 and 7 pounds, with its ideal weight being between 4 and 6 pounds. It has a small head with small, erect ears and a rather fox-like expression. The bright, dark eyes are of a medium size and are shaped like almonds. The Pom’s body is compact with a short, straight back. The Pomeranian has a double coat. There is a short, dense undercoat and a longer and rougher outer coat. Pomeranian puppies are very small when they’re first born, weighing no more than a few ounces. They initially gain weight every day and most weight gain takes place between birth and about 9 months. After this, they’ll typically add about another pound of weight between the age of 9 months to a year. After this, their weight should be stable. Increase in height will take place from birth until about 12 months of age, so as they get older the initially rounded puppy takes on a sleeker appearance. A well-groomed Pomeranian is one of the cutest and most adorable dogs you can find, and people just can’t help gushing over them. If you don’t take good care of their coat though, it can end up looking a real scruffy mess. In particular, while you can give your Pom’s harsh outer coat a quick brush with a stiff brush to make them look presentable, the woolly undercoat will very quickly get matted if left unattended. So most of your grooming attention should be directed towards maintaining the undercoat. Ideally, you should brush it every day and if not, then at least every other day. If you leave it any longer than this, you run the risk of it turning into a tangled mat of felt. A good tip is to mist the coat with a water spray before you begin. Also, try and avoid brushing the coat when your Pom’s dirty as this makes hair breakage more likely. You should try and wash your Pom first if they’re dirty. Only bathe your Pomeranian when you have time to dry them thoroughly. 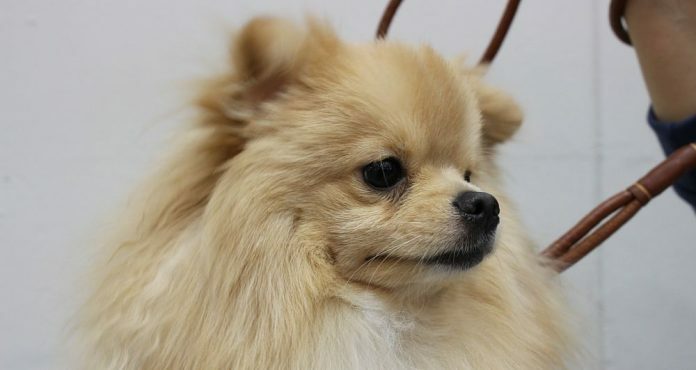 It’s not a good idea to let your Pom run around with a wet coat because their long hair means their coat takes a long time to dry and their small size makes them more susceptible to catching a chill. Pomeranians don’t need their coat trimming unless you really want to in order to cut down on their grooming requirements, or to keep them cooler during the summer months. You should never completely shave down their coat. Your Pomeranian’s nails should be trimmed every few months. If you leave them to grow too long, they may become ingrowing. It’s probably best to let a professional groomer trim your Pom’s nails. You should clean your dog’s teeth on a daily basis, the same as with all dogs. The typical Pomeranian lifespan is somewhere between 12 to 16 years. Teacup, or miniature, Poms tend to have a somewhat shorter lifespan than this. One of the leading causes of Pomeranian death, in fact the number one cause of Pomeranian puppy deaths, is trauma due to being stepped on, dropped, and so on. This is due to their small size and further emphasizes their unsuitability for families with small children. As you can see from the Pomeranian lifespan section above, Poms tend to be healthy dogs that live longer than average. They are less susceptible to cancer than most other dogs, especially toy dogs. That said, there are a few health issues that can affect them that you should be aware of. Patella luxation is a condition that affects the kneecap. The kneecap slips out of place and may remain like this, or may slip back. For this reason, the condition’s also known as “slipping kneecap”. Poms are more susceptible than most dogs. The seriousness of the condition can vary and it can often be treated with anti-inflammatories and/or rest. More severe cases may need surgery. Entropion is a condition that affects the eyelids. The eyelids, usually the lower ones, turn in on the eye. It’s not an especially common health issue in Pomeranians but symptoms to look out for include your dog using their paws to rub their eyes, a discharge coming from the eyes, excessive tearing and wetness around the eye. Your dog may also start squinting and you will also actually be able to see that the eyelid has rolled back. Your vet or a canine optometrist will be able to diagnose entropion, if you suspect it because your dog is showing these symptoms. The actual treatment will depend on how serious the condition is. For puppies, who may grow out of the condition, the eyelids are often stapled to keep them in place. With older Pomeranians, an operation may be performed to remove some skin from the eyelid. Hypoglycemia is one of the most common issues that can affect all breeds of small dogs when they’re puppies. It’s caused by a drop in the dog’s sugar levels, which can be quite sudden. Symptoms include loss of appetite, listlessness and unresponsiveness, uncertainty and lack of balance and coordination when walking, shaking and trembling, twitching, and seizures. Hypoglycemia is a very serious and dangerous condition and it can even be fatal in some cases. It can be caused by stress and anxiety, or not getting enough to eat. It’s also sometimes the result of another condition such as an infection. Smaller puppies tend to be more at risk of hypoglycemia. If you suspect your dog is suffering from hypoglycemia, you should take it to the vet immediately. You can also try to raise their blood sugar levels yourself by rubbing honey or Karo syrup onto your dog’s gums. For this reason, it’s a good plan to always have some honey available if you own a Pomeranian puppy, particularly a teacup one. You can help to avoid a Pom puppy getting hypoglycemia by making sure you feed them at least every four hours during the day, and making sure they stay warm during the night. Also, make sure the food you give them is relatively high in proteins, fat and complex carbohydrates. This is a condition where the windpipe can’t stay open when your dog’s trying to breathe. It’s caused by weakening of the cartilage that supports the trachea, with the result that the windpipe narrows. Toy dog breeds are particularly prone to tracheal collapse. Symptoms include your dog having trouble breathing, gagging, and a honking type of cough. Tracheal collapse is normally treated using cough medicines and also giving the dog supplements to strengthen the cartilage around the trachea. Severe cases may require surgery. Neck damage caused by your dog’s collar can be a cause of tracheal collapse, so it’s a good idea to always use a harness rather than a collar. Distichiasis is caused by in-growing eyelashes that can irritate the eyes. The eyelash either grows in the wrong place on the eyelid, or grows in the wrong direction. Symptoms will depend on the severity of the condition, including the number of abnormal eyelashes and how stiff or soft they are. If the eyelashes are very soft, your dog may not show any symptoms at all. In more severe cases, symptoms may include eye inflammation and redness, excessive blinking, excessive tearing, and discharges from the eye. Your dog may rub their eyes with their paws, and squint or keep the affected eye shut. In mild cases, no treatment may be required. For more serious cases, surgery is usually the preferred treatment. Pomeranians are very good watchdogs as they’re very alert and always on the lookout. If you’re not careful though, their barking can become an issue as they tend to bark a lot if they’re allowed to. Luckily, they’re intelligent dogs that are eager to learn and to please. That said, training your Pom not to bark excessively will still take time and patience. The best way to train them when not to bark is to ignore them when they do bark, and simply stand by their side without paying them any attention. Then when they stop barking for a moment, lavish them with praise and give them a treat. When they start barking again, simply ignore them until they stop again. The worst way to try and get a Pomeranian to stop barking is to shout at them. If you do this, they’ll just think you’re joining in with them and will bark all the more. Dog obedience training is pretty standard regardless of the breed. Positive reinforcement training is the best way to train any dog. Your dog is meant to be your best friend and you don’t want them to be scared of you or intimidated by you. Nor do you want to hurt them, and make them fearful, by using training methods such as shock collars. So when training, recognize good behaviour by praising your Pom and giving them treats and attention and don’t shout at or hit them when they don’t do as you wish. Stay calm and speak in a quiet but commanding voice. Because they’re so cute and cuddly, and so tend to get spoiled, Pomeranians can develop small dog syndrome if you’re not careful. So you should establish yourself as the pack leader as soon as possible and make sure your dog knows who’s boss.